General Motors has given electric vehicle enthusiasts an official, solid timeline for when you can expect to see Bolt EVs at your neighborhood Chevrolet dealer. Inside EVs has reported on a GM-developed schedule to roll out the 2017 Chevrolet Bolt EV nationwide, which shows every state receiving Bolt EVs by September of this year. 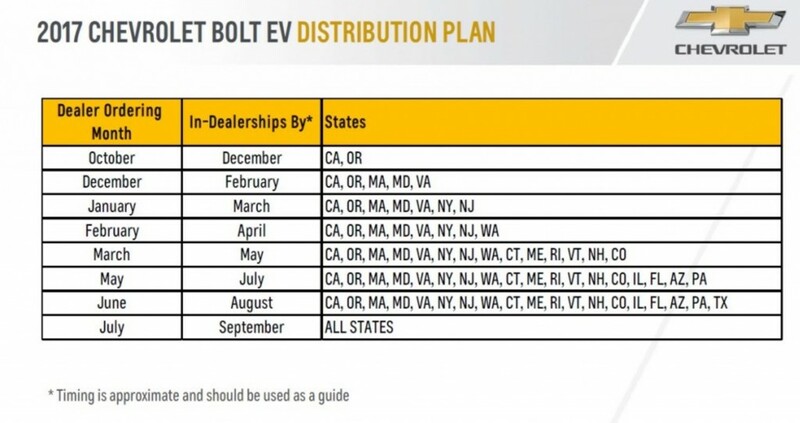 The first month on the left of the column represents when Bolt EVs may be ordered in the states listed. The second month represents when Bolt EVs will physically be available. The schedule coincides with a two-week shut down at the Orion assembly plant, where the Bolt EV is produced, and signals when the 2018 model year of vehicles will begin production. That means the Bolt EV’s available nationwide will be 2018 model years. As for where the Bolt EV will show up next, GM has stated the mid-Atlantic and Northeast regions of the U.S. will be of focus. What about the U.S. teritories? When will they get the Bolt EV? Our local dealers (Ventura County, California) cannot keep them in stock for longer than 48 hours. One dealer sold four by 2 pm on Sunday. Another sold 10 in less than 48 hours. If they keep selling the way they are in California, the other states might have to wait even longer or GM will need to increase production. It would be interesting to know just how much money GM loses on each Bolt it sells. From what I can gather this is a compliance car and they are planning on selling 30,000 cars a year. Normally, if a company makes money from a vehicle they will boost production as much as possible when the cars are selling quickly. The car is made in a factory that can certainly boost production above 30,000 if GM wanted to do that. 1. LG couldn’t supply more batteries/electronics. 2. GM would only lose more money by selling more. My state isn’t even on the list, guess that means September and might as well be a 2018. Really no Michigan till September thats odd considering the bolt is made there. I don’t believe Michigan is considered a large EV market, I live here and once in awhile I will see a Volt but that is about it. Would love to see a schedule like this for Canada. My understanding is that ordering might be available nationwide now with stock being delivered to Ontario, Quebec and British Columbia but there’s no word on when deliveries will expand to the rest of the country. My local dealer in Saskatchewan indicated they had an order cancelled due to the uncertainty with another still on the books with no clear delivery date. Are other provinces offering rebates? If not, GM will give priority to the ones who are. 14,000 in Ontario +1,000 for your house plug. Canada??? LOL There are no plans to rollout the Bolt to US Territories. Yes, Canada has always been our territory and always will be. You’re obviously as delusional as the ignorant village idiot in chief you elected. Guys like you have never seen much and rarely venture much further than your trailer park and surrounding junk yard. If you did, you would realize how far you have fallen and how the world has left you behind. Not only has it been released for Canada but it’s cheaper than what you can pay for it thanks to our competent, independent and forward thinking Socialist government. I am a GM retiree, I live in Mich. GM builds The Bolt In Mich. Why can’t I buy one, GM ???? i, for one would prefer to see viewer posts restricted to cars and the subject at hand rather than cheap and unwarranted geopolitical comments and attacks. Not only Americans are nationalistic about their homeland. That’s why the Olympics are such a big deal. Sure General Motors is an American company that operates internationally, competing against Japanese and German companies doing the same thing. So lets support GM and Ford and even Chrysler Division of FCA, their success is good for America (Did i hear that somewhere once a long time ago?). Supporting American companies is something to foster and be proud of. And let’s be perfectly honest, the Detroit brands are basically assemblers of Chinese components… So there won’t be a trade war or tariffs unless “one” (the puppet) wants to shut down every industry in the US.